FUNNVILLE - The Richmond Flying Squirrels, Double-A affiliate of the San Francisco Giants, announced on Tuesday that Trey Wilson will join the organization as the team's new play-by-play broadcaster and Director of Communications & Broadcasting. 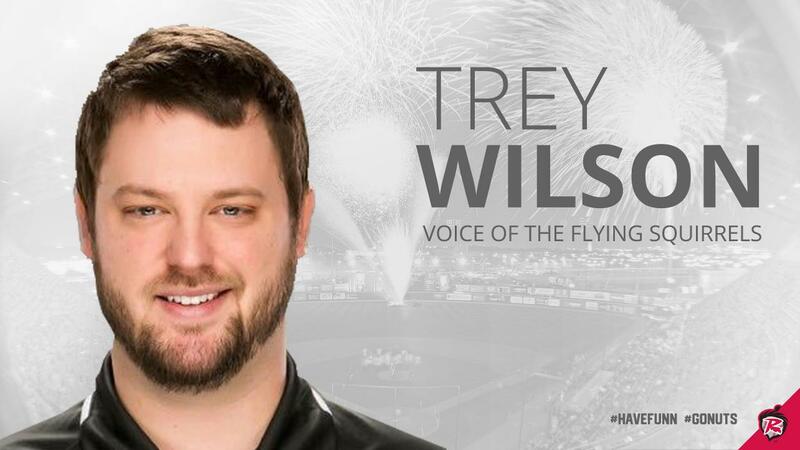 "The Flying Squirrels have had great success in the broadcast booth throughout our history and Trey will certainly continue that," said Flying Squirrels VP & COO Todd "Parney" Parnell. "His local ties and his experience in the Eastern League will make him a valuable asset to our front office staff and the RVA community." A native of Portsmouth, Va., Wilson spent the last four seasons as the play-by-play voice and Director of Communications & Broadcasting for the Eastern League's Altoona Curve, Double-A affiliate of the Pittsburgh Pirates. He is a 2013 graduate of Bluefield College, where he began his broadcasting career in 2010 and later served as Assistant Director of New Media & Sports Information. "I am beyond excited to come back to my home state and join one of the top organizations in the game of baseball," Wilson said. "Richmond is an incredible city and the Flying Squirrels have a passionate fan base. I can't wait to get started." Wilson, 29, began his career on the airwaves in professional baseball in 2013 with the Bluefield Blue Jays (Rookie - Toronto Blue Jays) and spent 2014 with the Lansing Lugnuts (Single-A - Toronto Blue Jays). He has also voiced college athletic events for various networks across the United States and high school state championship events in the Richmond, Hampton Roads and Northern Virginia regions. With the Flying Squirrels, Wilson will be the lead play-by-play voice for the team's radio broadcasts on Fox Sports 910. He will also head the club's media and public relations work, host the TV show "Flying Squirrels Insider" on Community Idea Stations and assist with graphic design, social media and the organization's digital presence. Wilson takes over for Jay Burnham, who earlier this month was named the new play-by-play broadcaster for UMass men's basketball after six seasons with the Flying Squirrels. Tickets for the 2019 Eastern League Celebrity Home Run Derby & Funnville Fan Fest and the 2019 Eastern League All-Star Game presented by Genworth go on sale Saturday beginning at 9 a.m. Fans can purchase tickets in person from 9 a.m. - 2 p.m. at the Flying Squirrels Ticket Office located on the first-base side of The Diamond or online at squirrelsbaseball.com. Follow the Flying Squirrels for future announcements regarding the 2019 Eastern League All-Star Week presented by Genworth.